April was such a remarkably beautiful month, that it almost felt like vacation! 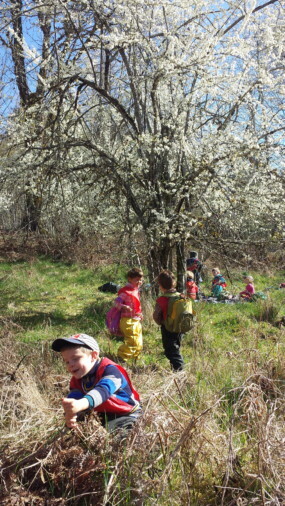 The abundance of life around us in the forest, the warmer temperatures, and the strong bonds that have developed between all of us (educators, children and parents too) made April a beautiful month for exploring. 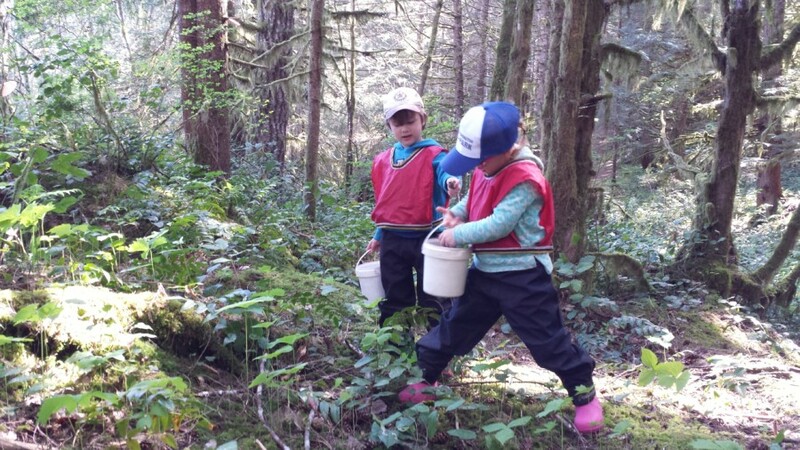 With Earth Day in April, it was a month for us to examine our role as stewards of the forest, and to think of ways to help keep the forest healthy. 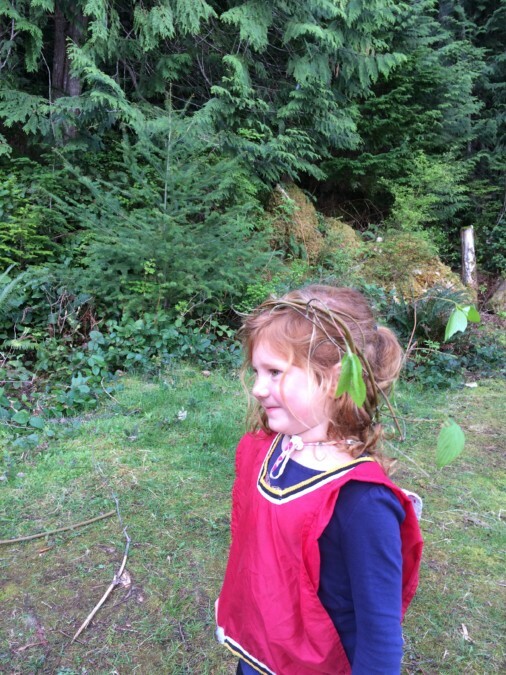 The children have definitely developed a strong tie to the place where they learn and play, and often don’t need Heather or I to remind others about showing respect and care for the forest, and each other. Rather, they give each other friendly reminders, and have dialogue surrounding issues where not everyone agrees. These Seeds have grown so much since September – and we still have two months to continue growing! I’m looking forward to what May will bring! These guys have become so familiar with the routines, expectations, etc that they often lead them! We’ve seen friends delegate cone placement, friendly behaviour reminders and taking the reins on leading play and exploration. On our first back I saw some amazing connection being rekindled amongst the kids. Sometimes it comes out in play as one kid ‘saving’ another as Nolan is here in this beautiful setting. Juniper and Kieran are ‘reading’ this book together. 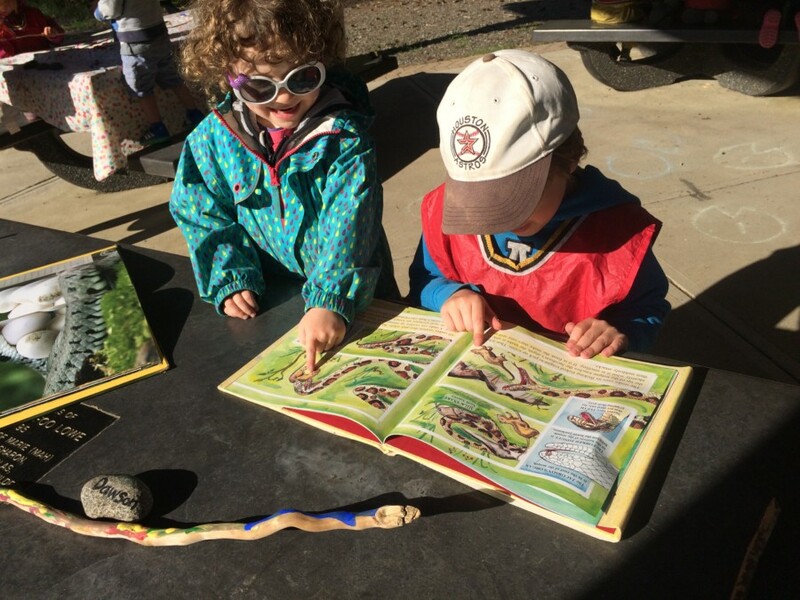 By sharing their understanding of the pictures together they create a deeper understanding of both the intent of the book, what they each already knew about the topic, and each other. 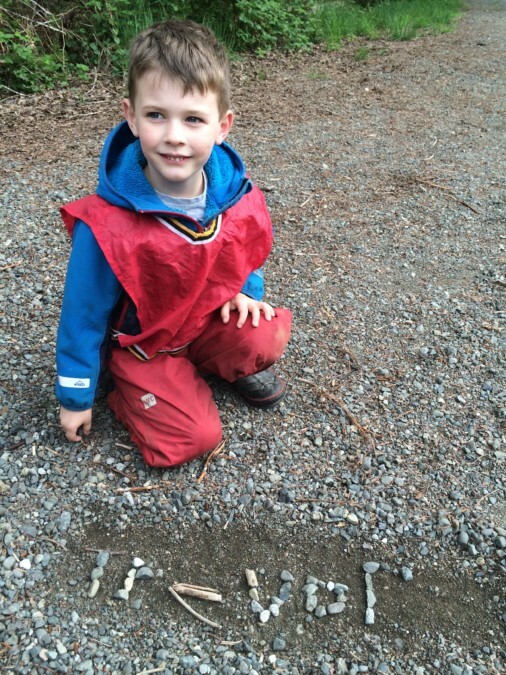 Trevor was proud to share the writing of his name in rocks! Other kids were inspired too. Isn’t it amazing what you can do with just plain old gravel? A muddy face is a happy face! 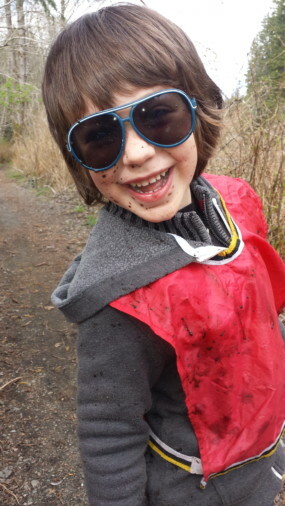 Even being joyous can be a great help to group, bringing light and a fun atmosphere like Theo, even when he is dirty! In this game, Delilah and Kieran were playing bears. They were collecting cones in their buckets to store for the winter, they even had a refrigerator! What I noticed is that they were also being inclusive when they invited other friends to join their play, and some did. 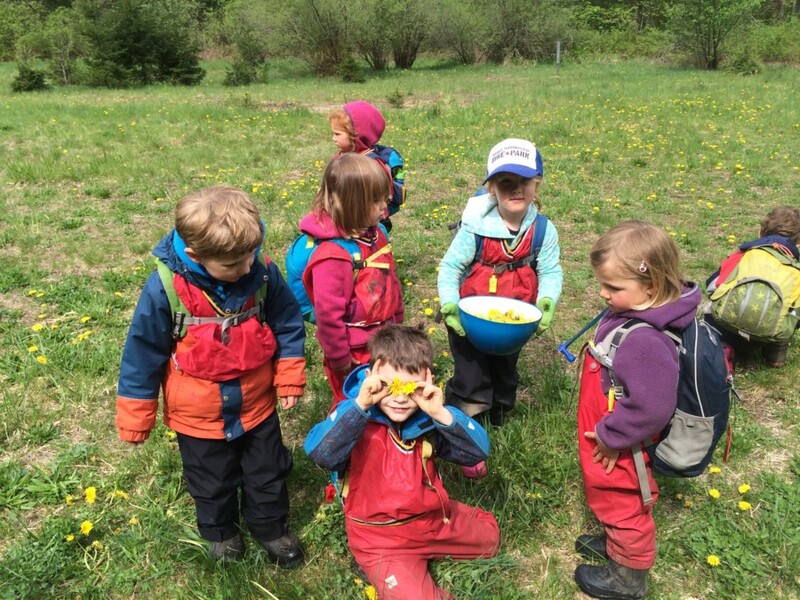 Here Delilah carries the bowl for the whole group to put their dandelions in for making dandelion jelly. What a fun way to spend part of a sunny morning! 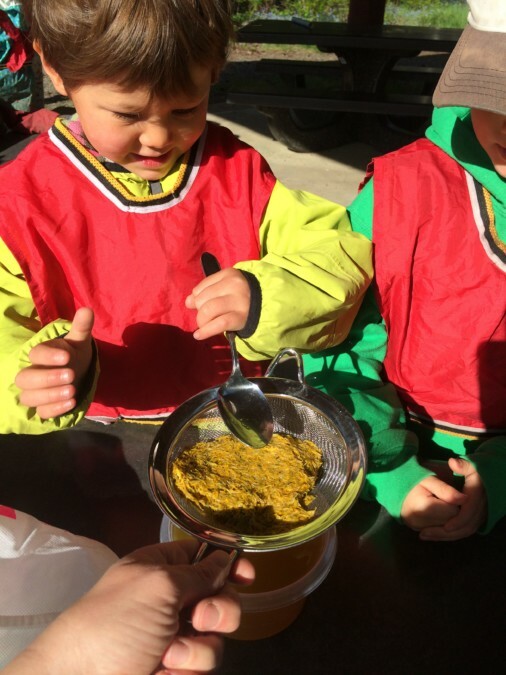 Pi leads the way in making dandelion jelly as she has experience doing it with Alix in the past! She shared each step with her friends and was willing to help Alix along the way as well. 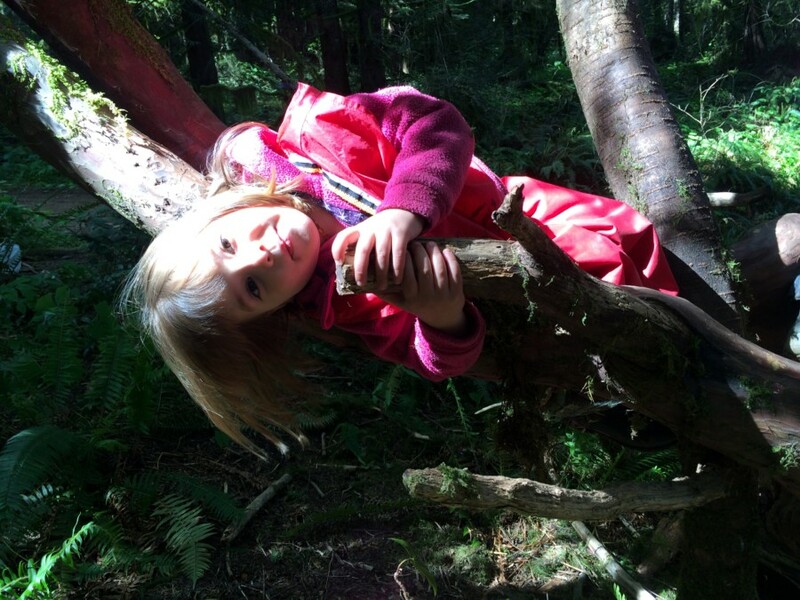 Jaylynn claimed she loved climbing and hanging out this tree. And I don’t blame her! She and others were sharing the minimal space the branches provide and working around each others hopes of getting from one branch to another! 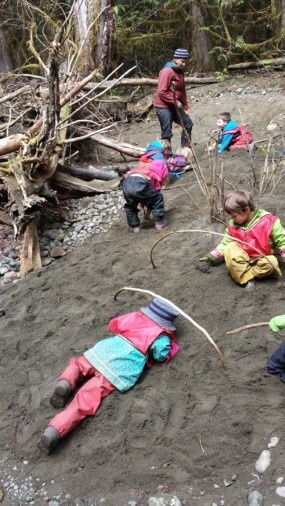 Back at our log jam classroom, we have found nature’s sandpit and have made us of it in many ways! Juniper does an army crawl under some rainbow sticks as her friends look on and try it themselves. 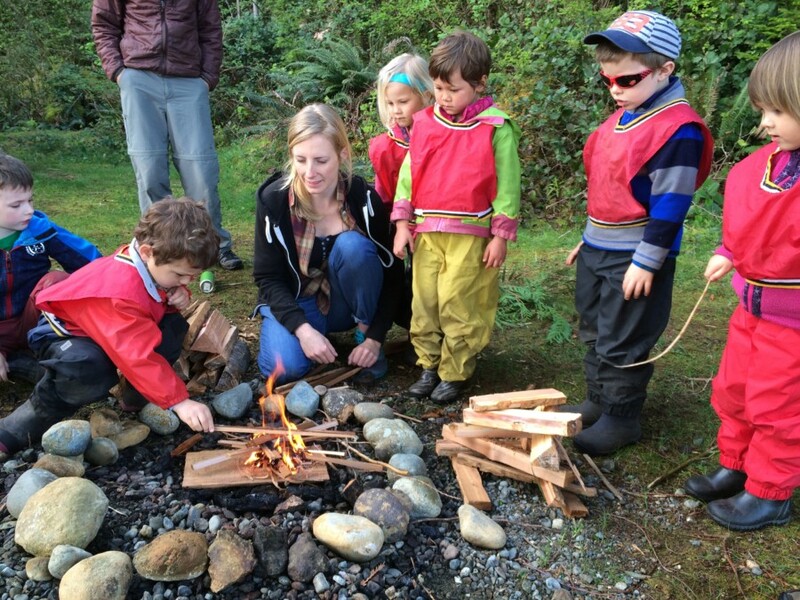 Thanks to Emily and Will from the Cumberland Lake Wilderness Society we had a great day at Comox Lake starting a fire, making bannock and exploring the steep and tricky trails! 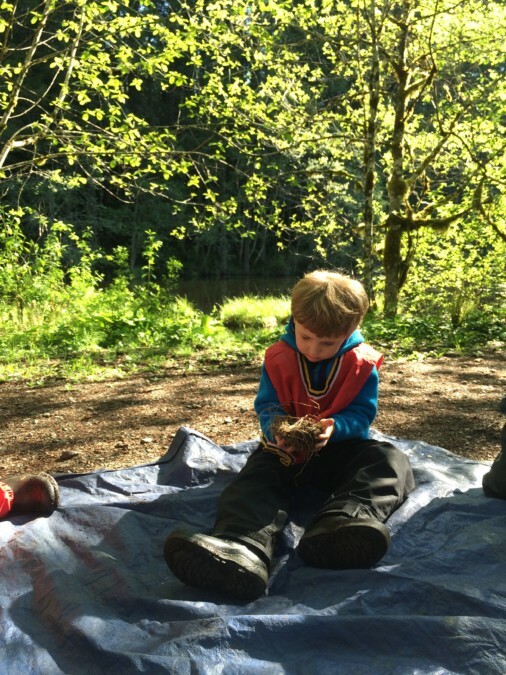 Parents joined us and it was a great opportunity to experience real wilderness survival skills. 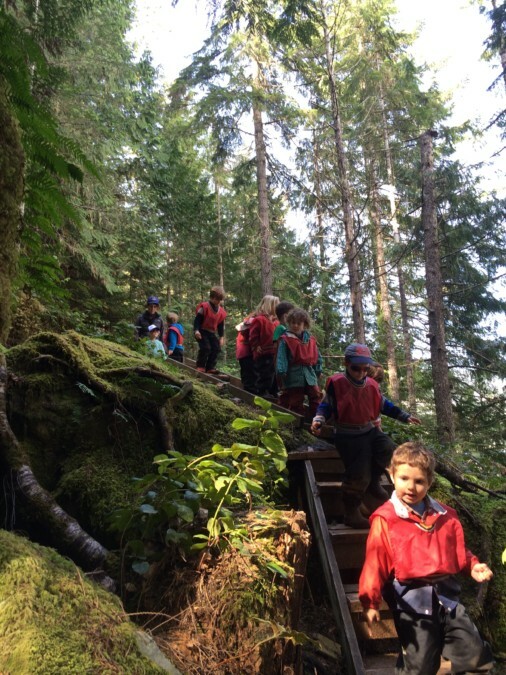 The kids loved hiking the tricky trail SO much they couldn’t get enough and wanted to keep going, going, going, up and up! I was impressed to their stamina and fearlessness. 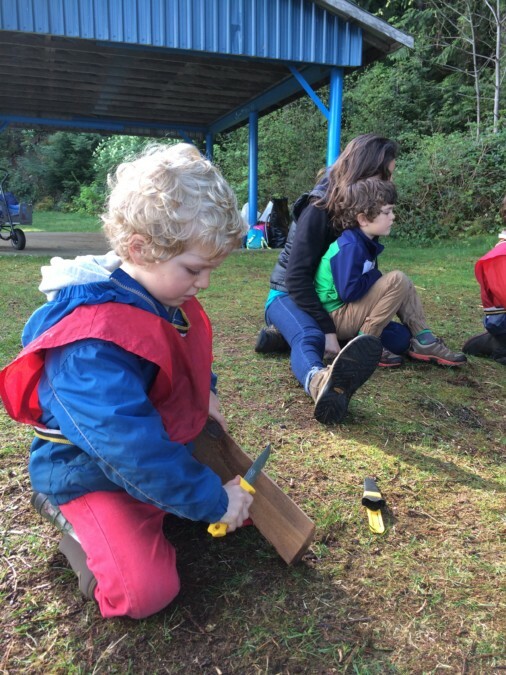 Carefully placing the wood on the fire, the forest friends practiced being safe around fire while at the same time gaining a better understanding of why and how a fire starts and burns! We like to give the children opportunities to use real tools appropriately, with guidance, specific instruction, practice and some trust they can certainly show us their abilities to take such activities seriously and with a new air of pride, accomplish them. Here is Jared, trying his hand at creating tinder by shaving off bits of cedar. By the lakeside we engaged in some water play like throwing rocks and steeping appropriately deep in the water. 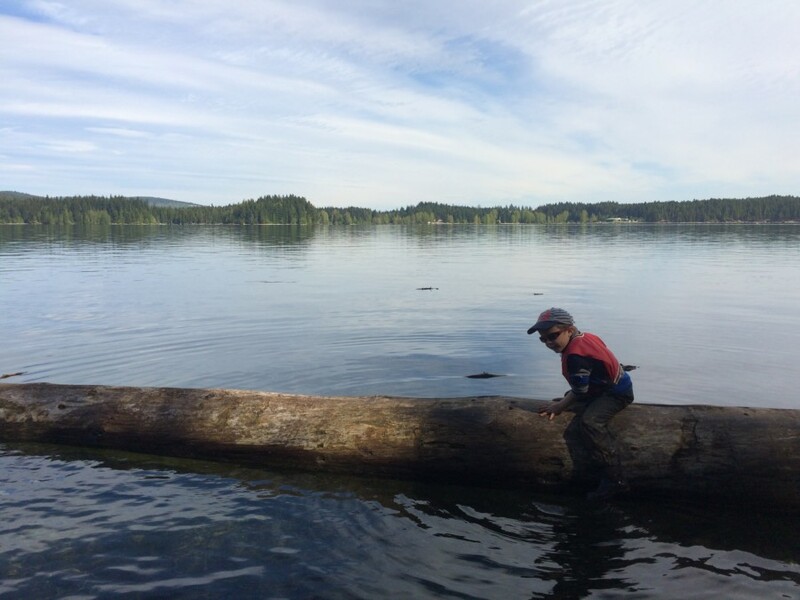 Here Nolan had a chance to show us when he knew it was far enough to go out on this log: “When my boots touch the water, it is time to go back”. The group exclaimed that they wanted to keep going and going on this steep, tricky and winding path alongside the lake. They really proved to us their strength and interest in exploring! April is surely a time alive with wonders of birth, sprouting and growth. We spend the first few weeks delving deep into the murky waters of the pond by the Bridge classroom. There we found a plethora of insects, tadpoles, salamander eggs, not to mention the shoots of many young and intriguing plants. We wondering about the hatching of ducks eggs, and a few weeks later witnessed a team of ducklings following their mother to the pond just past the pavilion. It was a marvelous sight! 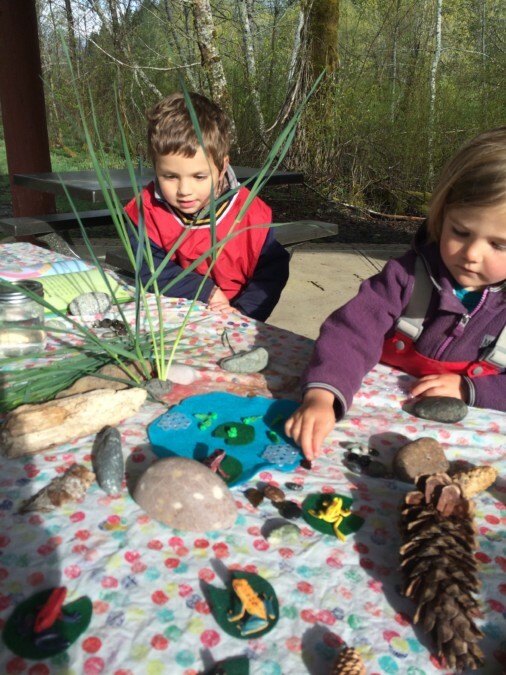 We had a pond – play morning complete with frog’s eggs and tadpoles to explore and ignite discussion one morning. Gemma loved playing with the frogs and imagining what they might do. 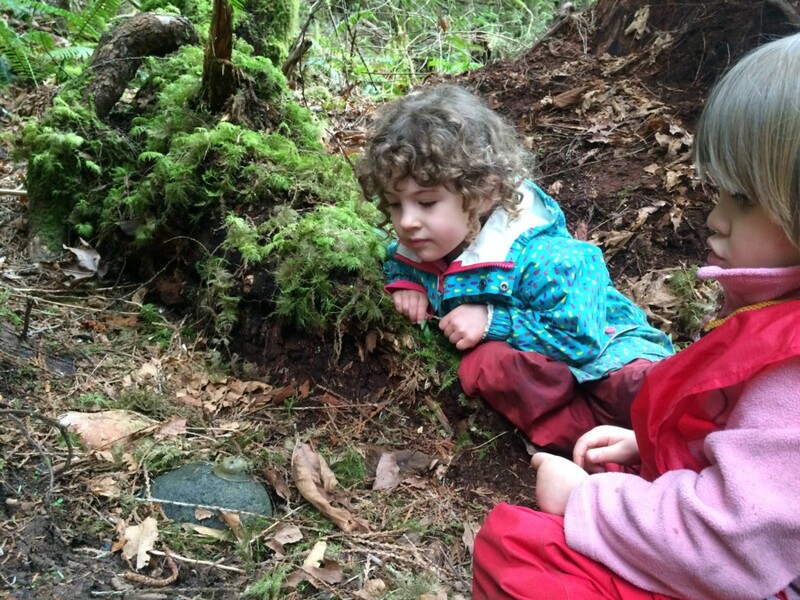 Juniper and Jaylynn share in the wonder of watching a springtime slug. These magical creatures can hold entranced for their slow movements and sensitivity to movement makes them great fodder for discussion around care and compassion for other animals. 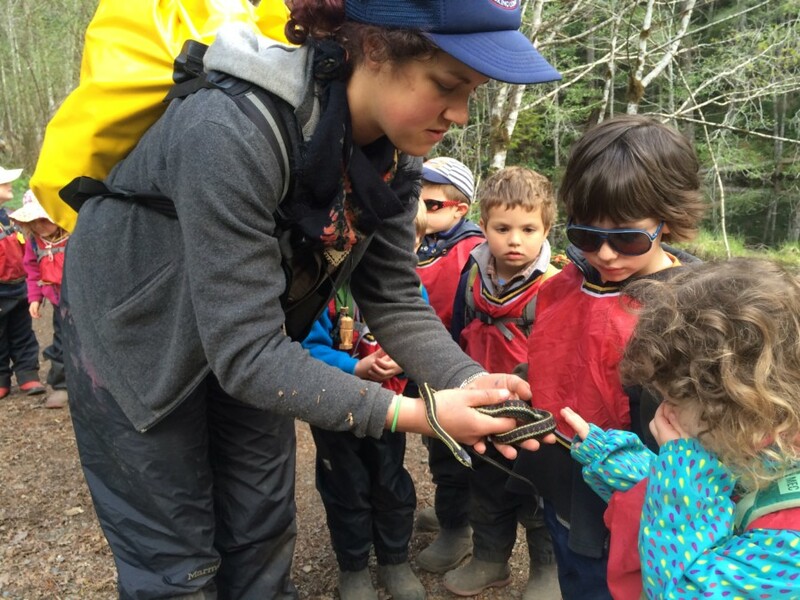 We’ve seen a few snakes now! This large garter snake gave off a ‘stinky’ defensive secretion to fend us off, you can see that Juniper is plugging her nose, but it was worth the stench to get a close up look! James investigates the bird’s nest Jaylynn brought in from home for mystery Monday. We imagined the baby birds that lived in there – they would’ve been tiny! 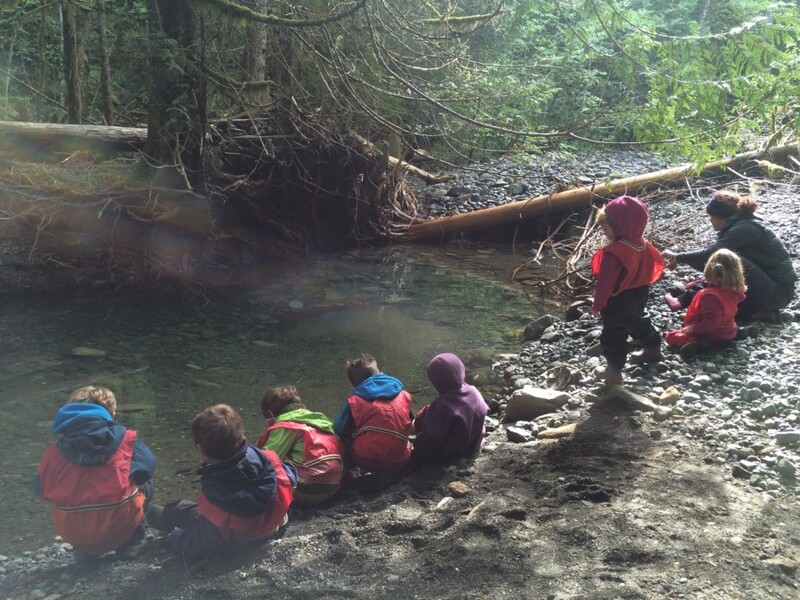 We found a magical pool past the log jam classroom. It had a little water trickling into and some trout, small to large, swimming in it! The water stopped flowing at this pool, and we wondered about the plight of the fish. But mostly, this place was so peaceful we just enjoyed the sounds and sights it brought us. 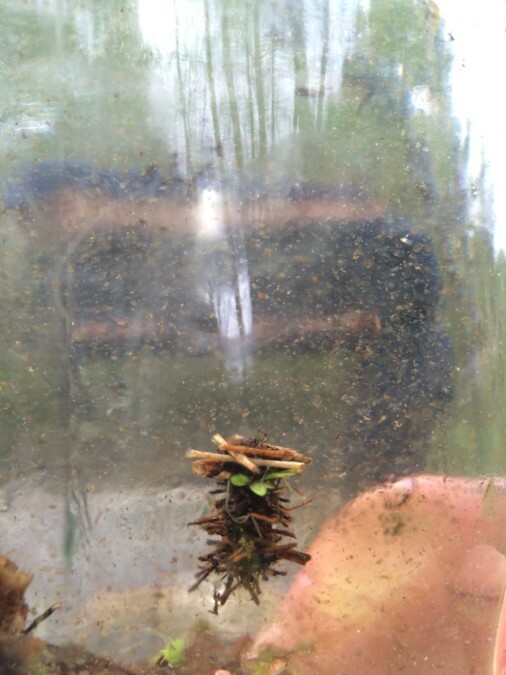 Thanks to Alix’s skills of research, we discovered that our mysterious pond life that seemed like it was a weird worm, but with legs, that built a home for itself out of bits and pieces of wood, and could travel up and down in the water is…. a Caddisfly Larvea!